Thomas Jefferson, the third president of the U.S., built a brewhouse at his Monticello estate after his presidency ended. Now visitors will be able to enjoy an ale inspired by Jefferson's recipe. RICHMOND, Va. – Thomas Jefferson is renowned for his many interests, including architecture, horticulture and inventing gadgets. Among the third president's lesser-known pursuits was making beer, and modern-day visitors to his mountaintop estate at Monticello can soon get a taste of the past. The Thomas Jefferson Foundation says it's working with Starr Hill Brewery in Crozet to offer Monticello Reserve Ale, inspired by what was produced and consumed regularly at Monticello. Brewing beer was among the plantation's important activities, and the drink was one of the "table liquors" served with meals, Monticello officials said. Starr Hill's master brewer Mark Thompson will brew Monticello Reserve Ale using a combination of lightly hopped wheat and corn, as Jefferson did in his day. Local ingredients will be used, including some hops grown at Monticello. The unfiltered wheat-style beer will be make its debut at the Thomas Jefferson Visitor Center on February 21. It will later be sold at Monticello and Charlottesville-area restaurants. 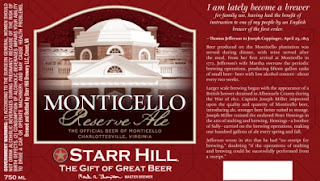 See Jefferson's Monticello makes ale inspired by past for more of the Monticello Reserve Ale story. Beer in Colonial Virginia is a previous post about another historical brewing in Virginia.